All our back issues are available online and it’s fun (and okay, sometimes embarrassing – finding typos is so unnerving!) to look back on all the people we’ve featured and the stories we have shared. John Pirzek first appeared in the summer 2011 issue of airdrielife, bravely telling the story of having Asperger’s Syndrome at the age of 14. We were so impressed with him, John became our distribution manager all through high school (with help from mom and dad). LIFE TODAY: John is a fourth-year apprentice with King’s Kontracting Ltd., and will complete his Southern Alberta Institute of Technology (SAIT) training early 2019 to earn his journeyman distinction in carpentry, with Red Seal Certification. He is looking at pursing the option to take a business course and earn his Blue Seal Certification, as well. 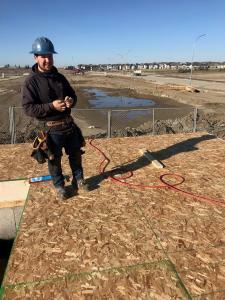 Next for John is joining the Airdrie business community with the start of his own company, Pirzek Contracting Inc. “I plan to build a responsible and reputable business, providing Airdrie and area with general contracting services,” he says. He is still an active volunteer with the Airdrie Festival of Lights, and helps out with the Nose Creek Valley Museum. John’s hobbies include crafting furniture and hunting, and recently he picked up his saxophone and joined the Airdrie Community Concert Band under his former high school band teacher, Jordan Harris. Airdrie has been John’s home for 15 years now, and he has worked hard to ensure he is active and participating in his community. Our summer 2009 cover was the first and only time we featured a couple and what a story they had to share. Tim Harriman and Christa Boccabella fell in love while on Tim’s bike tour across the country to raise awareness and funds for the Childhood Cancer Canada Foundation. Sadly, Tim passed away in September of 2010 at only 22. What is your best memory (or what are you most proud of) from your and Tim’s travels to raise awareness? Tim visited many sick kids across the country, he stopped at every major pediatric oncology center in Canada. Imagine a hospital playroom full of kids, parents, nurses, media… Tim noticed a young girl looking out of her window while all of the other kids were busy playing and getting pictures and autographs from him. The nurses said she couldn’t come out of her room and hadn’t been out of her room for a number of weeks due to having an immune system wiped out by chemo. Tim left the room filled with people to visit with her, the smile never left her face. I remember when he came out of her room and hugged her mom, he said “this is why I’m biking across Canada. For her and for kids like her.” It was never about Tim, it was always about the kids. Tim taught Canada that there is always room for Hope. Looking back what do you feel you learned the most from having Tim in your life, and if possible – what did losing Tim so soon teach you? The life I had with Tim, while so brief, was all-encompassing. Together we faced incredibly dark and lonely times, we climbed mountains we didn’t even think we could summit – but then, on the other hand, the beauty in our lives was beyond anything I’ve experienced before. It was all about the moments for us. I think I’ve carried that into my life now. The moment’s count – the hugs and kisses, the holding hands, the belly laughs, the goofy dancing in the kitchen, the making of messes, the conversations over coffee, cuddling up to watch a movie, hiking in the rain, the everyday normal stuff too – it all counts. At the end, when Tim was gone, and to this day, it’s those moments and a thousand more that fill my heart. In your early twenties, you think you’re invincible, he taught me that despite the best efforts, sometimes life just plain hurts. All we can do is remember that this life isn’t about us at all, it’s about others. It’s about love and kindness and making the most of the moments we have together. Tell us a bit about your family today and what makes it so special to you – tell us about your photography career and why you love it. I remarried – met an incredible man named Ryan and he swept me off my feet. We have two beautiful children, Charlee (4) and Kai (15 months). We have a really great time together as a family – our sweet kids keep us laughing, they bring an endless supply of joy to our everyday lives. We love hiking, exploring and finding new adventures together. I’m really thankful that God brought Ryan into my life, he arrived at the most perfect time and has given me a life I could have never imagined. I’m surrounded by love. It’s bliss. Everybody faces hard times, no one is immune, but I strongly believe that there is always a brighter tomorrow if we chose to see it that way. I had to keep reminding myself that Tim passing away wasn’t the end of my story., it was only the beginning. I went on to become a nurse, a wife, a mom, and have been busy with photography! I love it because it allows me to give people memories to cherish for the rest of their lives, moments frozen in time. I get to meet the most interesting people and families. These days people get all funny about social media and taking too many pictures and not enjoying the moment – there is a line for sure – but I say take the pictures! One day that is all you’ll have left. Capture not just a face or a smile, but a moment that makes you feel something wonderful deep in your heart. Our winter 2010 cover featured alpine athlete Jeff Bell who at 17 demonstrated some serious drive and determination. Jeff has joined the corporate finance team at MNP in Calgary and is studying for his CFA (Chartered Financial Analyst) designation. Having travelled the world he is happy to be home in Airdrie. Its 2018 what are you doing now? The last few years have been amazing and wonderful for me! I’ve graduated from an amazing program at Montana State University as the captain of the NCAA alpine skiing team. But like many sports, skiing has taken a toll on my body (with a few surgeries to show for it) and I retired from racing at the end of the last ski season. I’ve watched many of my friends before me retire from the sport and come away with a huge void in their life. My solution to this was DeSonus (an annual charity event that just had its successful 4th annual event! See what it is at www.desonus.ca). I needed something to transfer my passions to from ski racing, so I built that something from scratch. I’ve used DeSonus as the vehicle to fill that void in my life that I knew was coming, and I have to say it has worked pretty well so far! I have many goals around DeSonus and what it is going to look like in the years to come, but giving back, music, and community will always be at the focal point. There is lots to come with DeSonus, stay tuned! Aside from community and school, I have joined the corporate finance team at MNP in Calgary. I help entrepreneurs sell their businesses and divest from the companies that they have built from the ground up. In terms of my goals, I would love to join the ranks of entrepreneurs one day. What that looks like exactly, I am not quite sure yet, but the ideas are always flowing. For now, I’m loving my team that I have the privilege to work with at MNP, and I am busy studying for my CFA (Chartered Financial Analyst) designation in my spare time. I have moved home and am living in Airdrie right now. Although I have been blessed enough to travel the world and live abroad, it feels so good to be home. 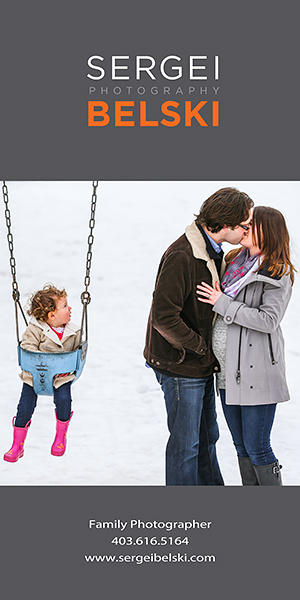 What does “life in Airdrie” mean to you? Life in Airdrie to me means community. Community to me means inclusion, being kind, having fun together, being supportive, lending a helping hand when needed, and giving back. All things that I would list as Airdrie’s best qualities! 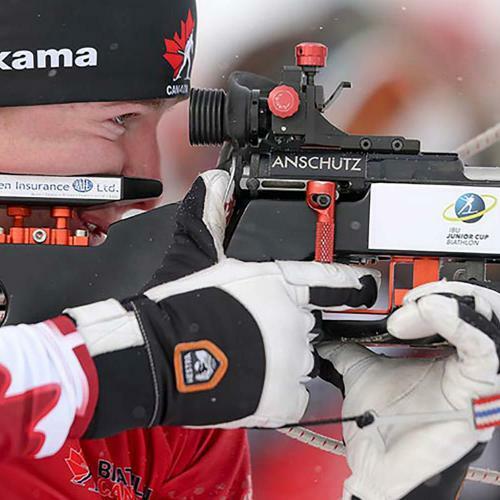 What did your competitive skiing years teach you – how has it helped you succeed today? I would never trade anything for the experiences and life lessons that skiing and sport taught me. I owe much of who I am today to my sport and the people that were there along the way. Living on your own and pushing yourself towards a goal teaches you many life lessons that you don’t get to generally develop until later in life. Time management, learning to fail, work ethic, and mental resilience are just a small selection of what you develop in sport. You also grow a sense of community and what it means to be a part of one, which in my opinion, is key to living a happy life. How has skiing and sport helped me succeed today? It may not have given me the ideas and interests that will help me be successful, but it certainly gave me all of the attributes that live below the surface that will help me get to where I want to be. 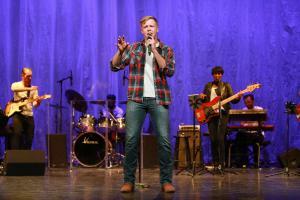 Whether it is sports, art, acting, singing, music, or really anything that you can be passionate about. Find it, pursue it, make mistakes, learn from them, and grow as a person and contribute to your community. The Nielsens are family friends. And at one point, my neighbours, so when I started doing neighbourhood “snapshots” it was only natural I knock on their door. 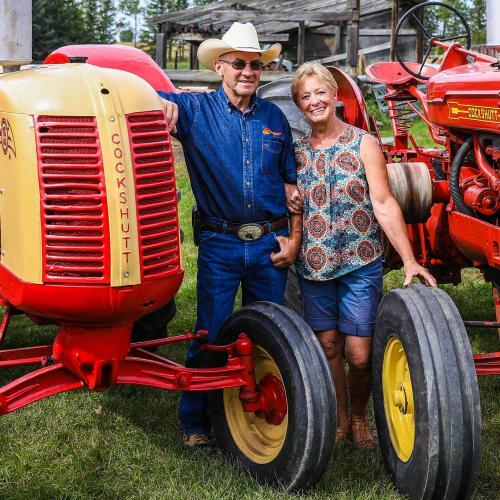 Back in 2004, Mark and Brenda talked about life in Thorburn and what they loved about raising their kids Cody and Kelsey in Airdrie and we checked in on them again for our 10th annual issue. 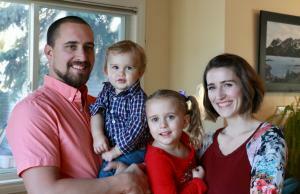 This time it’s Cody and his wife Marie who shared their own family update and their ongoing life in Airdrie. LIFE TODAY: Mark and Brenda downsized to a bungalow in Bayside a year ago and when not spoiling their first grandchild, are out in the mountains as much as possible hiking, kayaking or cycling. Daughter Kelsey is in her third year at University of New Brunswick in Saint John studying psychology with a criminology minor. 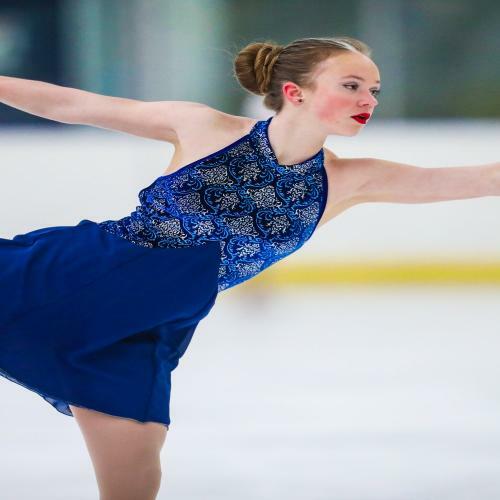 She heads to Maynooth University in Dublin, Ireland for the winter term this January. 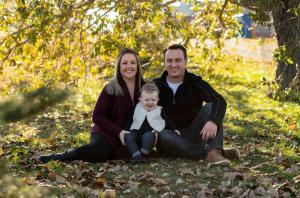 Cody and Marie Nielsen are happily starting their own airdrielife story in Hillcrest with their 15-month-old daughter Emma. Marie also grew up in Airdrie; she is the daughter of Beverly and the late John Stringile (who was the branch manager of the downtown Airdrie TD Bank for the last 15 years of his career – the same branch Marie now works at as manager of customer service). On raising Emma in Airdrie: “We look forward to getting her involved in sports and activities in the community when she gets older. We want Emma to be raised with the same values that we were brought up with, and we feel that where you live plays a big role in that. 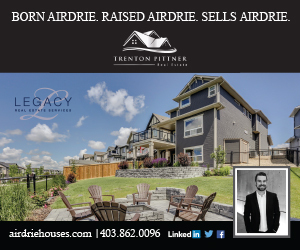 Airdrie has grown substantially since we moved here, but we feel it is still the right place to raise our family. The fall 2011 cover was a fun one to do – I called in all my favours to get the props and begged young Sarah Ferguson (another family friend) to pose for the cover. 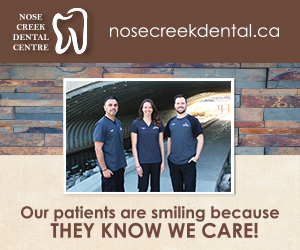 She was a great sport (and a natural in front of the camera); it’s no wonder she pursued theatre! 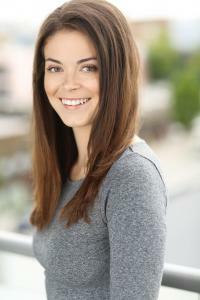 LIFE TODAY: Sarah completed her Bachelor of Fine Arts degree in theatre performance from Simon Fraser University in June of 2017. It was there that she found her love for devised theatre, and the thrill of creating her own work. This passion fuelled her involvement in the 2018 rEvolver Festival where she performed in Geologic Formations by mia susan amir. She is a company member of Sour Dog Theatre in Vancouver. (Dog Sees God, 7 Stories, Queenpins of Ponoka, Girls Like That). Like every good actor she is also working in a restaurant while striving to create meaningful and inclusive theatre. In fall 2010, Dr. Wendy McClelland made the cover on a “Vets and Pets” feature and I remember our former editor, the late Anne Beaty, was quite pleased to make me put her favourite animal (cats!!) 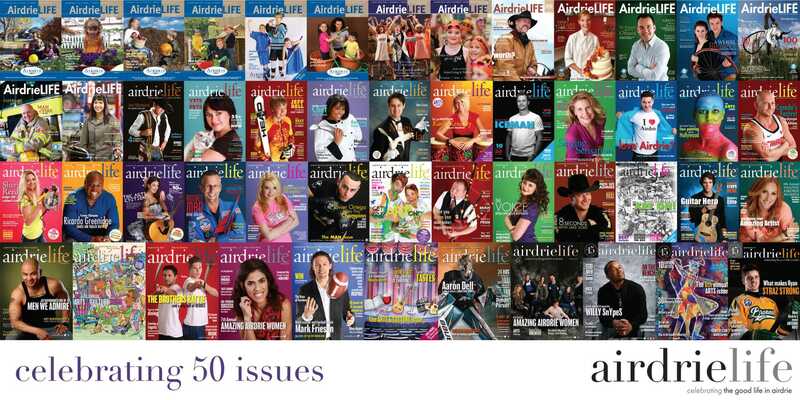 on the cover of airdrielife. 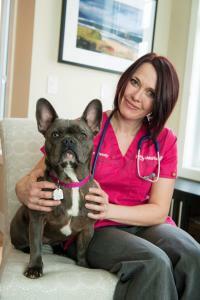 LIFE TODAY: Wendy went on to become a huge success in her practice and business Vets To Go – with four Vets in the Calgary/Airdrie area and three in Edmonton. In 2015, Vets To Go won the ATB Calgary Chamber’s Small Business of the Year award and the Deloitte Start Up Award at the RBC Canadian Women Entrepreneur Awards.